I remember buying my first WildC.A.T.S. issue. It was in a little shop above Praça da Alegria in Lisbon in 1992. I was starting to buy my own original comics, not the scarce and bad Portuguese translations. It felt like buying something illegal, on a tiny shop that looked like a smuggler's hideout where all the comics had their prices in dollars and the seller converted it to escudos when we bought them. Those were happy days. A good friend had lent me a lot of american comics in the previous two years and that really expanded my universe. And then Image was born and Jim Lee was at the helm. It felt revolutionary. Something that was not DC or Marvel but also not completely unfamiliar, I mean, Jim Lee was as familiar as you could imagine. So, Image's WildC.A.T.S. (Covert Action TeamS) came out and I was there that day to pick issue #1. It was the first comic I bought regularly and some years later it would be my first standing order at BdMania, the amazing store now at Chiado. The WildC.A.T.S., which ran five volumes (we would call them seasons now), were amazing. Like Image, their banner, they were at the same time refreshingly new and very familiar. It took me a while to understand that was Jim Lee's magic as well as Brandon Choi's. 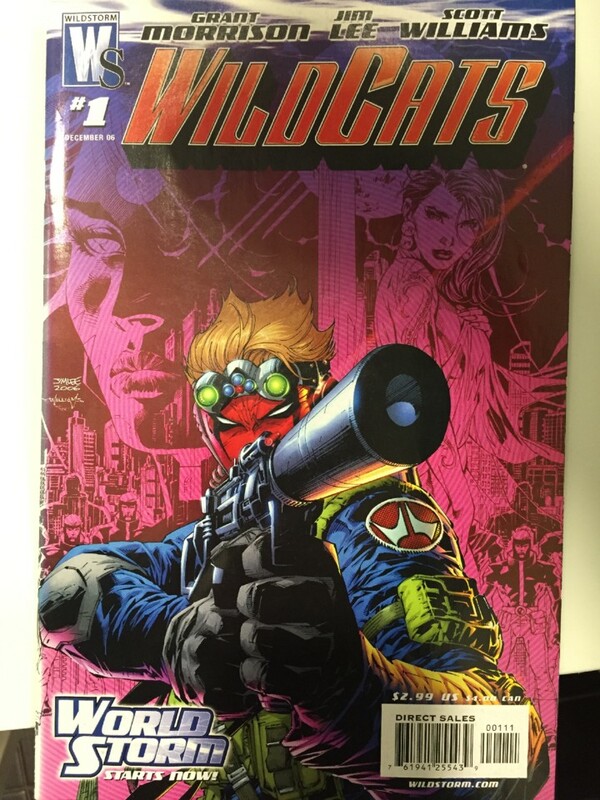 The wikipedia makes it easier to tell a personal story without much remorse for withholding details so I'd rather dwell on how the WildC.A.T.S., later Wildcats, were very important to my growth as a comic book reader. And still are. The first incarnation of WildC.A.T.S. ran from 1992 to 1998 and it starred some heavyweights just trying new stuff. Besides Jim Lee WildC.A.T.S. took in Travis Charest, Chris Claremont and.... Alan Moore. Yes, Alan Moore was there and it was a privilege to be able to experience his skills in what was, at the time, my favorite comic, even surpassing the X-Men. It was an amazing series that lasted fifty creative and gritty issues. And the girls, they just looked gorgeous. To this day I can't choose between Zealot and Voodoo. From Volume 1 onwards Wilcats got different, got with the times, got better, got worse, but it never got the initial excitement that was also the novelty of Image and all that it meant during the 90's. But I loved all the transformations, all the evolution. It helped me understand what comics could be, so different from tv series, books or movies (but curiously very close to some recent tv experiments by DC and Marvel, such as Legion and Happy!). It helped understand that (not so) awful cliché "change in continuum". I even loved that Volume 5 only included one issue. What an excitement, back in December of 2006, to buy a new Wildcats from Grant Morrison, Jim Lee and Scott Williams only to find out a little later that it had been cancelled. When the Wildcats finally ended in December 2010, technically in this decade but a lifetime ago in my personal history time, it was in a way the end of an era. For almost two decades the WildC.A.T.S. were my favorite comic book series and team. First out of sheer delight and then as a commitment to a team that had entered my life and helped me build my own conception of comics and their importance. Some of the most important artists in the comics world took a part in this history and helped me discover new stories, some that were already classics but that I didn't know, such as the Watchmen. Because the Wildcats were home for a while to so many different artists it would be almost impossible for DC/Vertigo to choose them for an Absolute Edition, such as the ones it makes for some of its most important series (The Sandman of course, always The Sandman, but also Death or Danger Girl) but DC did just that for Jim Lee's WildCats. It's more a tribute edition than an absolute edition because Jim Lee was always there in spirit but not always in pencil and so much of the Wildcats didn't make it into this Absolute Edition but it reminds us of how important that title was. It reminds me of Praça da Alegria in the early 90's, of Atlanta in mid-decade and Chiado at the beginning of the century. It reminds me of how Marvel and DC rule the comic world but new, good things can still flare up and brighten our minds. It reminds me that comics are forever the essence of cool.